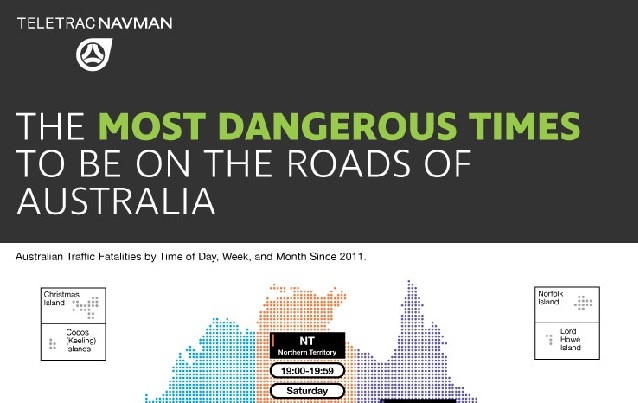 The Most Dangerous Times to be on the Roads of Australia #infographic ~ Visualistan '+g+"
Whether you’re a current resident of Australia, or you’re planning your dream trip Down Under, it’s good to know the current traffic situation. If you’re concerned with personal safety, you should be aware of the traffic fatality statistics in your area. For world travelers, this guide from TeletracNavman.com.au provides a detailed look at car crash fatality statistics Australia, which are broken down by time by state/territory, time of day, week, and month. The data stretches back to 2011, so readers will get a very complete look. For example, this data from Australian GPS Fleet Management company, Teletrac Navman suggests that the most extreme accidents happen on Saturdays, in the late afternoon. Travelers should avoid being on the road at these times. Additionally, Autumn is the worst season for accidents in about half of the country. No matter which part of Australia you live in or are exploring, this guide is for you. Make traffic safety an integral part of your overall travel experience!